This post has been so long coming! 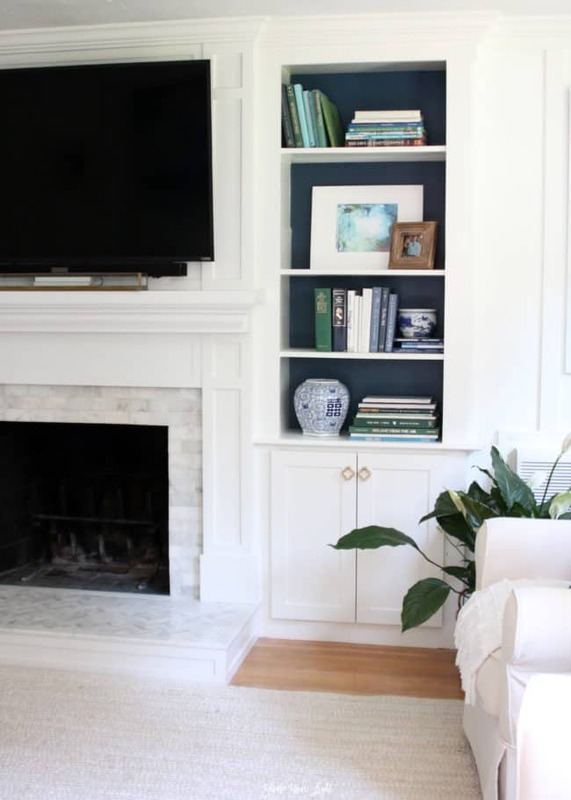 At the suggestion of one of my lovely readers ages ago, I rounded up all the posts about our fireplace renovation and put them together in one place as a reference guide. If you feel like you’re never going to get through all the projects your house needs, take heart. I started this in November 2015 and finished it….last week! 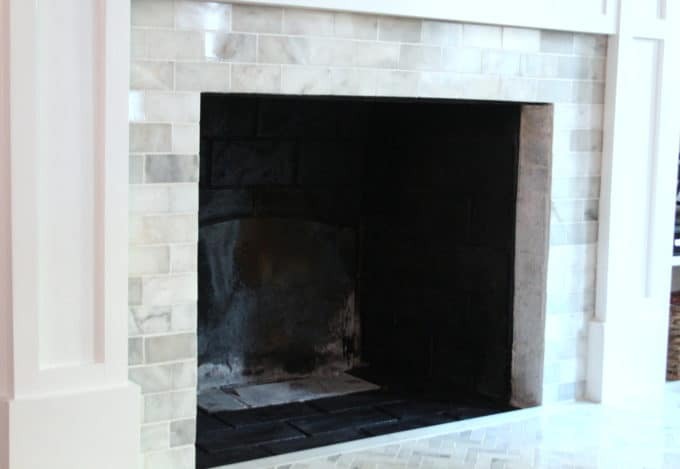 All set with fireplace makeovers? Check out the pea stone patio and fire pit build here, or perhaps you’d enjoy one of these furniture flips! 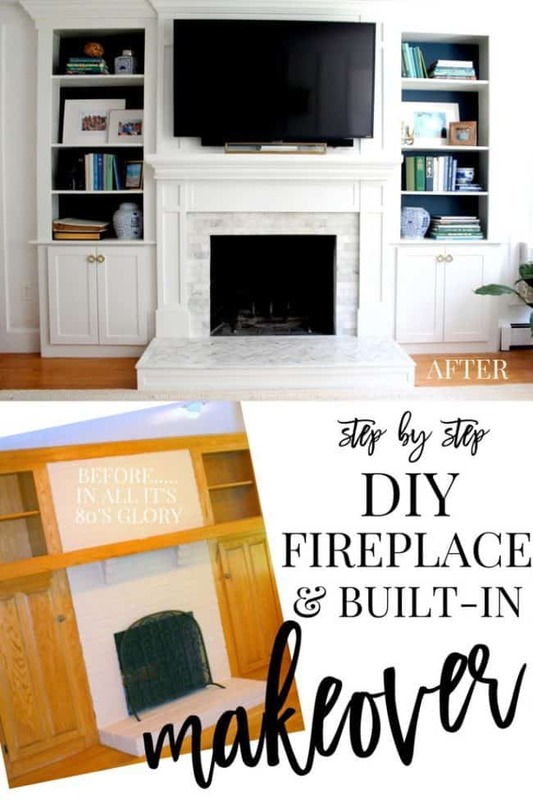 If you’re looking to update your fireplace, here are all the steps I took to giving our outdated fireplace and built-ins a much needed makeover. 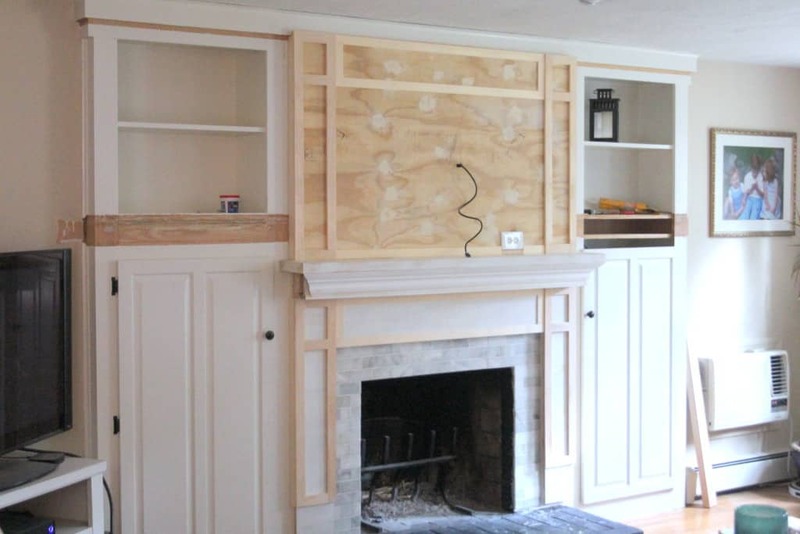 We started with a peach painted brick fireplace and cabinets on either side. 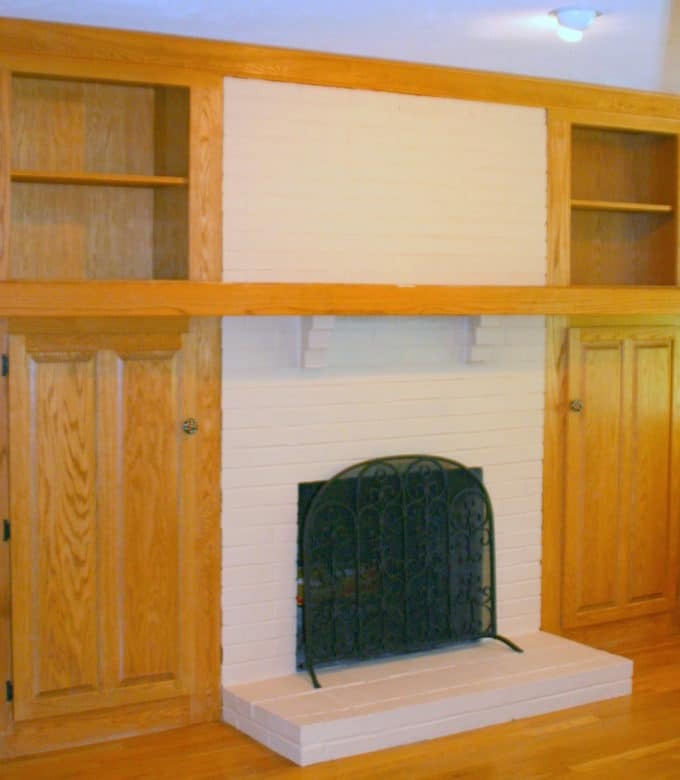 While we loved having built-ins, the mantle was weirdly high and objects on those shelves always felt out of balance. We also decided to mount our TV over the mantle (not my favorite choice design-wise, but it was really the best option for this room). You can see how we wired the TV behind a new upper mantle and relocated an outlet in PART 2 of the reconstruction posts. I installed the upper mantle so that it would extend out from the bookcases a bit and give this wall some definition. 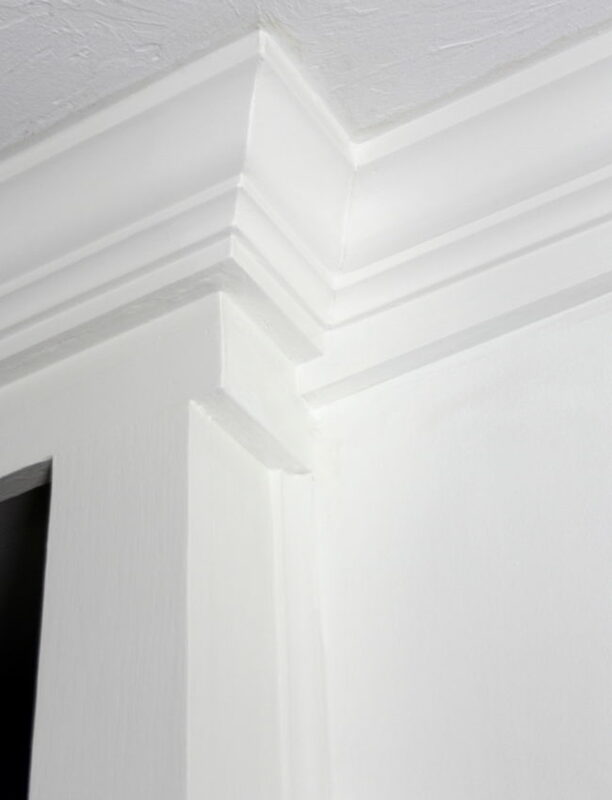 The crown moulding I added really accentuates this and is a little detail I love. 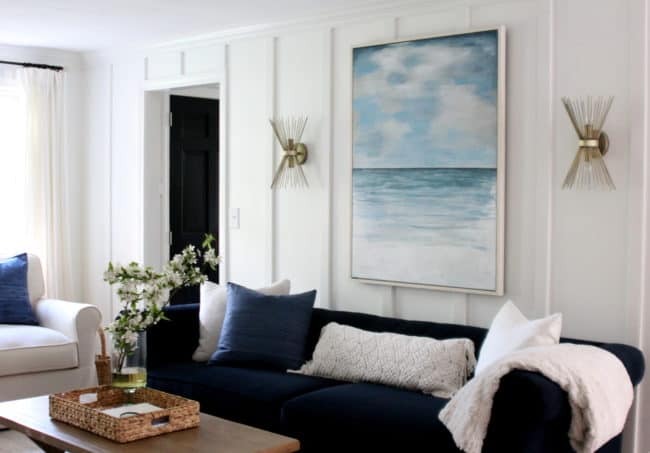 Every nook and cranny of the newly rebuilt surround, built-ins and trim got caulked, putty-filled, sanded and painted after tarping off the rest of the room. Using a paint sprayer required a lot of prep, but made the project SO much quicker and easier than brushing and rolling on the paint, and the finish is really smooth and beautiful. 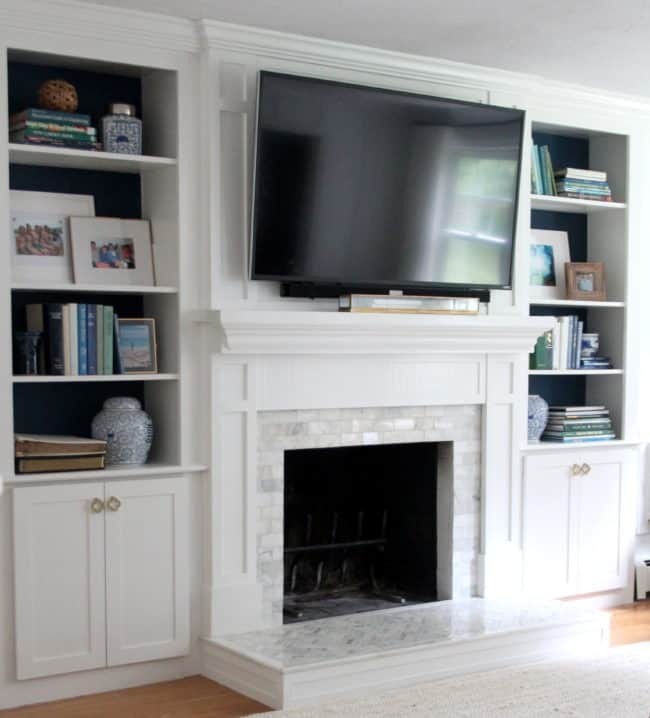 The fireplace surround and bookcase paint color is Benjamin Moore White Dove OC-17 in semi-gloss. I also painted the bookcase backs with Benjamin Moore Gentleman’s Gray 2062-20 (leftover from our master bedroom and also used on the coastal bathroom vanity). 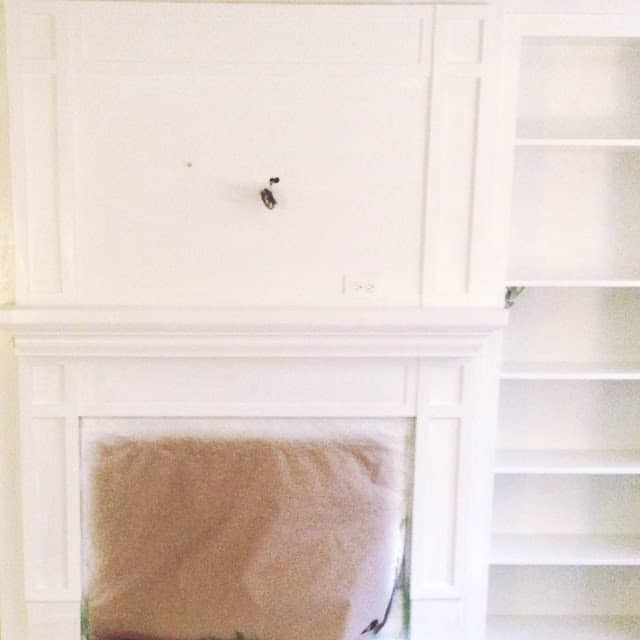 You may notice that one of the boxes of the bookcase is bigger than the others; that’s the result of removing the old mantle. The shelves are built into the sides of the bookcase and are not removable without cutting them out with a saw, a task I decided wasn’t worth making the shelves all uniform! 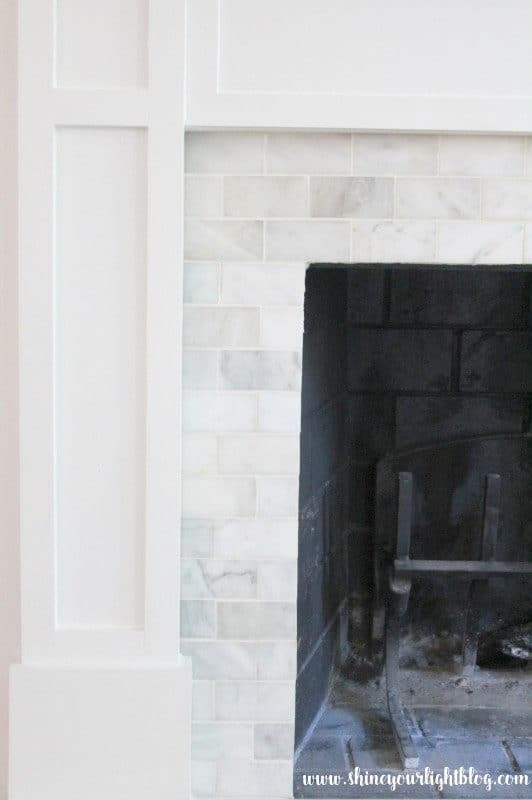 I tiled right over the existing brick surround with these marble tiles and this completely transformed the look of our fireplace! Love at first site!! 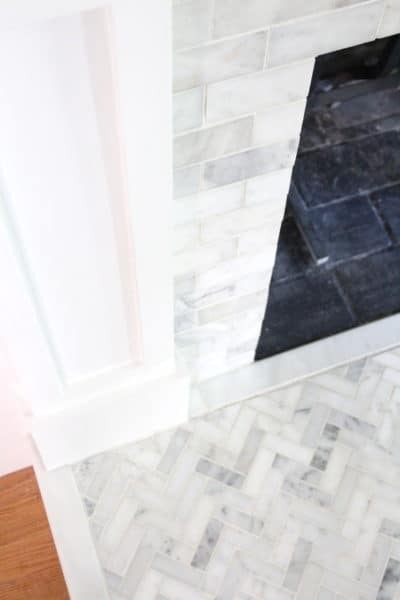 We were planning to have a thick slab of slate or honed granite cut, but in the end I went with my heart and tiled over the brick hearth with this herringbone marble, and created a border with marble threshold. I also framed and trimmed out the base of the hearth. I had to install cement backer board to even out the surface of the existing hearth, but if your hearth is level you can go right over brick with tile adhesive. 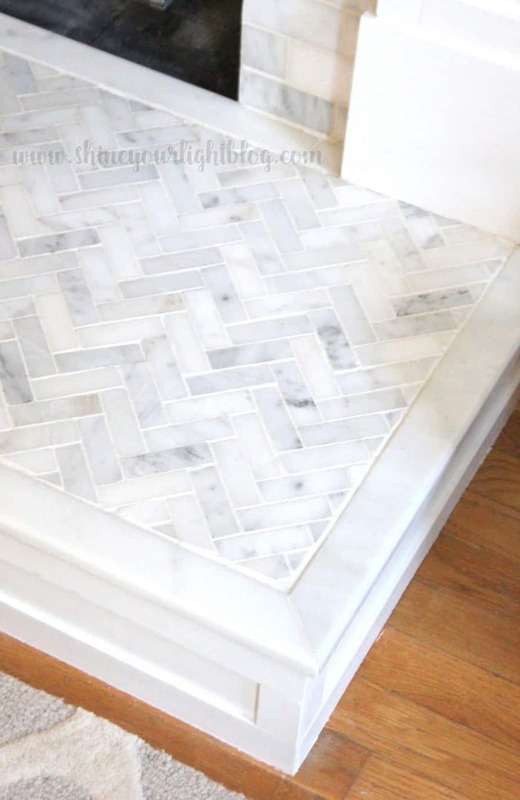 This is a really important step when using marble tile around a fireplace or near a cooktop! 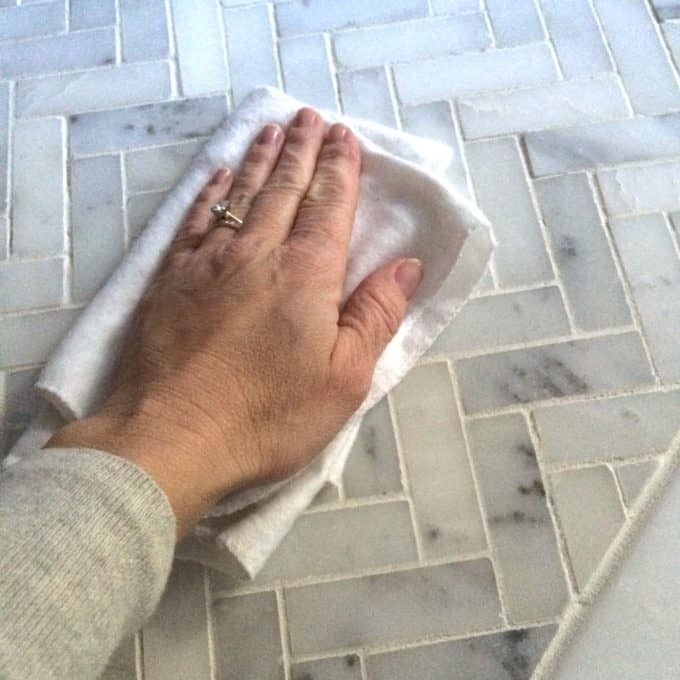 I had a bit of a trial and error experience my first time around – you can read about what I did wrong and the best product to use to seal marble tile in this post. 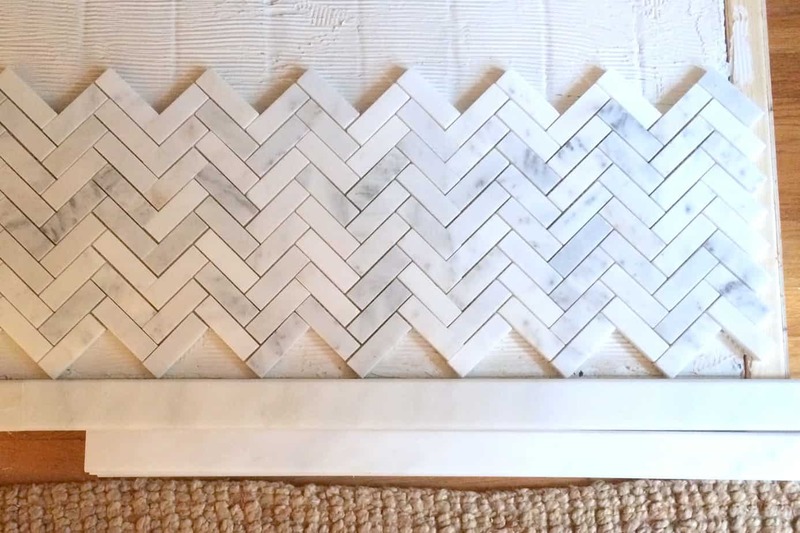 Our fireplace is wood burning, and we use it all the time from October through April, so I did a lot of reading about the best practices of cleaning a fireplace box. 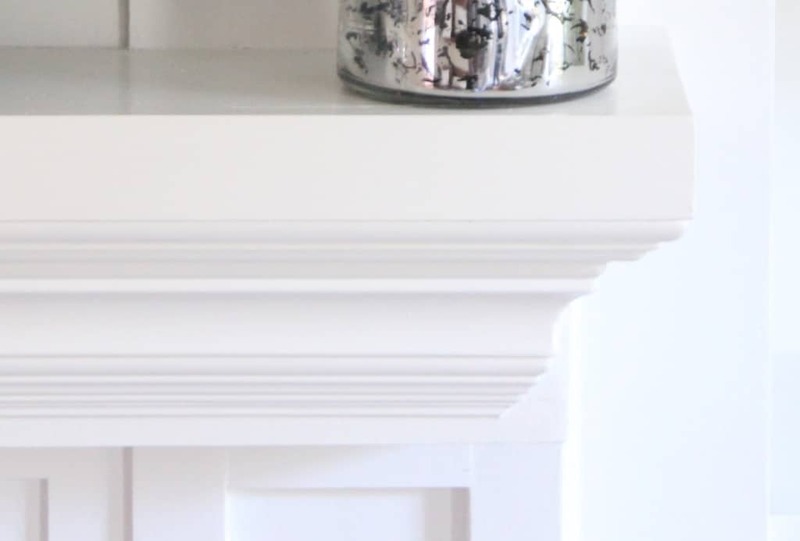 Read all about what parts of the fireplace box to paint and what to avoid. 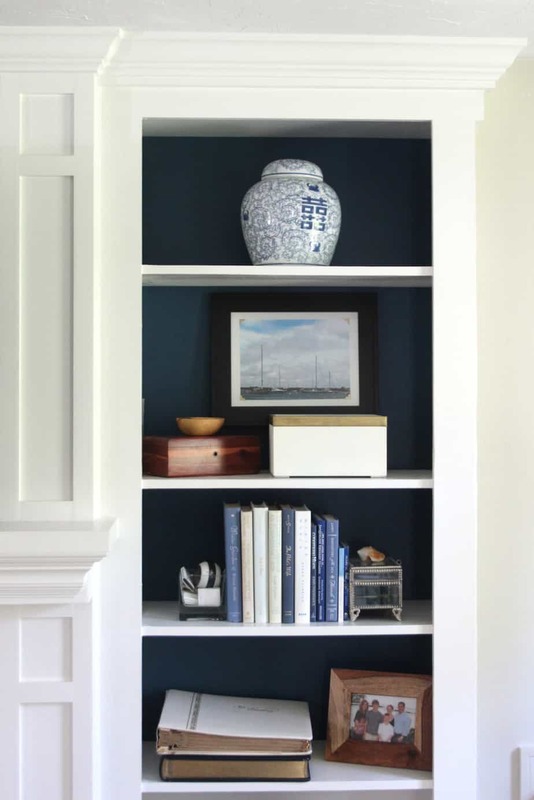 We liked the bookcases open from floor to ceiling, but eventually I grew super weary of having to keep all those shelves styled and pretty – plus what house couldn’t use a bit more storage space? 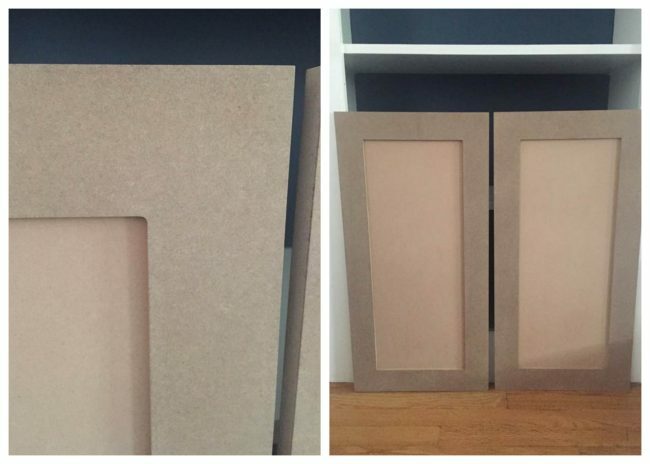 You can read about adding the cabinet doors in this post. 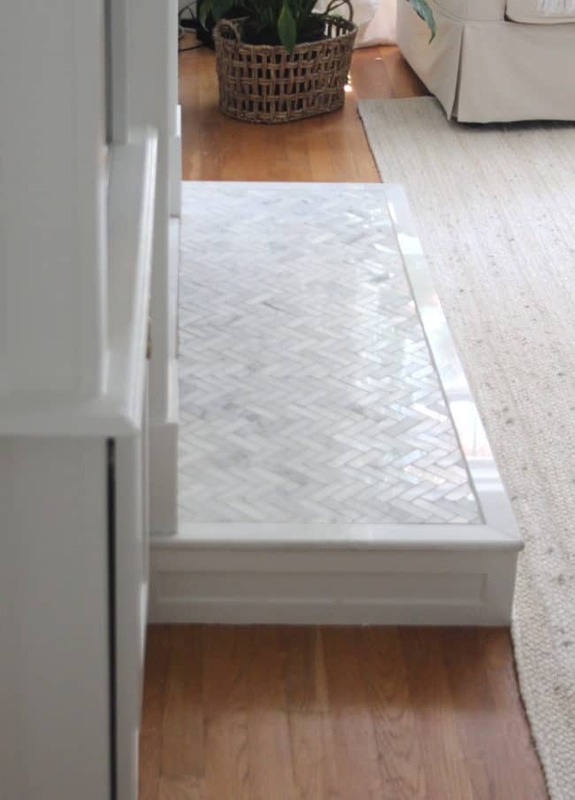 Can we talk about this glorious hidden storage?!! 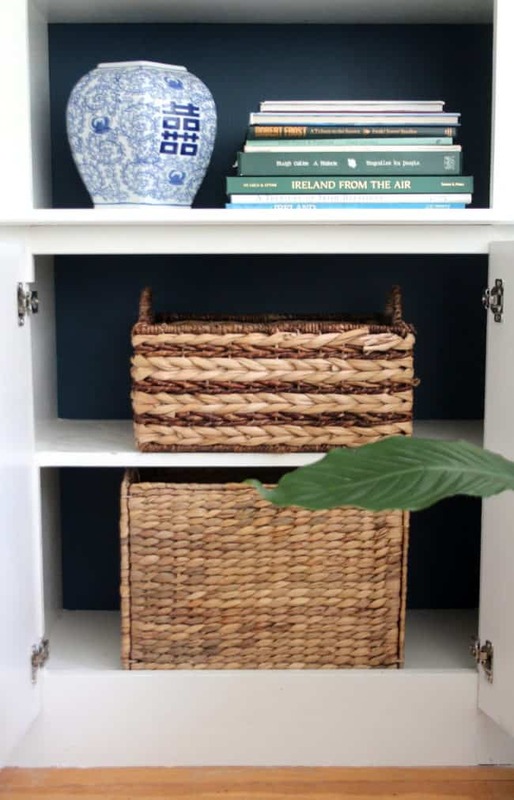 I’m actually looking forward to cleaning out junk drawers, organizing random household things and taking advantage of this newfound space this summer! And the pretty new pulls don’t kill me either! 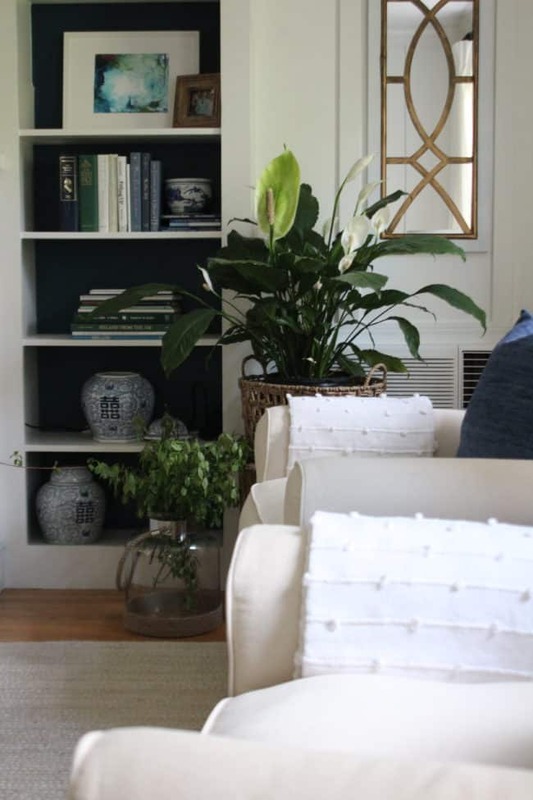 See the whole family room makeover reveal here! 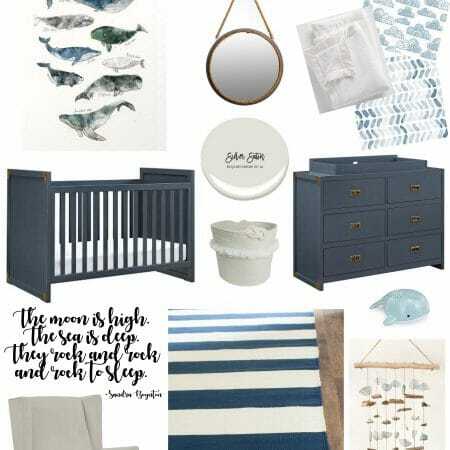 Find all the materials used for the various projects within each post I linked to. If you have any questions I haven’t covered just let me know! Hi Sara, thank you so much for your kind words! We researched the feasibility of mounting the TV over the fireplace for 2 years before we did it as we were concerned with the heat too. If the outside of your fireplace doesn’t get warm when you have a fire your TV should be fine. Our fireplace brick above the mantle didn’t heat up at all when we had fires, so for us the bigger concern was how much smoke the fireplace emits into the room that could affect TV function over time (not to mention our health!!!) We have frequent fires so we ended up buying a fireplace grate and backplate that significantly helps the flow of the smoke go up the chimney vs. into the room. SO much better for us AND as an added bonus, better for the mounted TV. (It also helps the wood burn more efficiently so you use less of it.) I highly recommend it if you have a wood burning fireplace…it’s called the Grate Wall Of Fire. 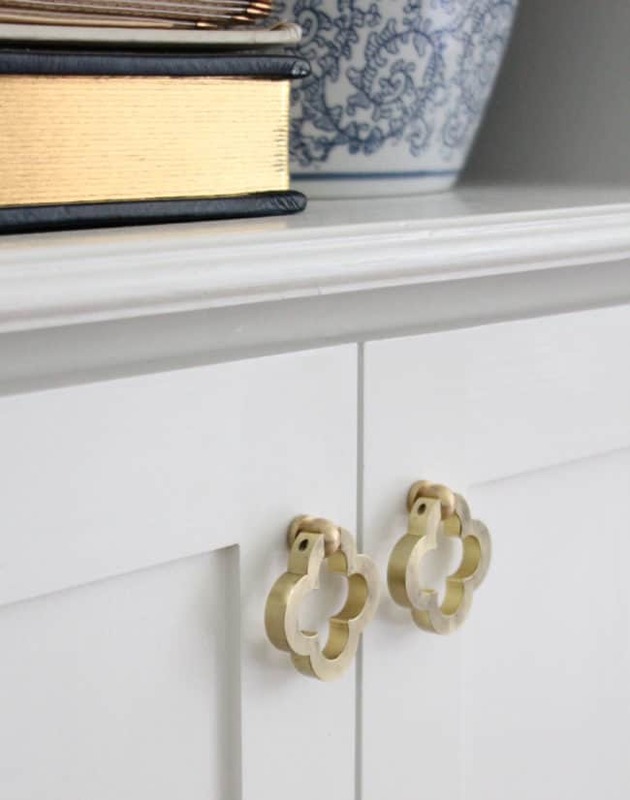 So that’s the deal on mounting the TV on the fireplace…..the cute new pulls are from Etsy – here’s the link! https://rstyle.me/n/c5ak96b3qwp Hope all this helps! Lisa, the transformation is incredible. You did a great job. Thank you so much Lauren! Hope you have a great weekend! totally worth all of that work you did- they are beautiful! i love the hardware you chose! Thanks Cassie! The hardware is my favorite part!